As some of you may already know, I have been under quite a lot of pressure from many medical professionals to lose weight, as there are various theories that weight loss in patients like my self with idiopathic intracranial hypertension (IIH) reduces intracranial pressure (ICP), eases headaches, and improves papilledema. Naturally I would want to improve all of these symptoms, I wouldn’t wish the pain I get in my head on my worst enemy, so of course I want to lose weight. 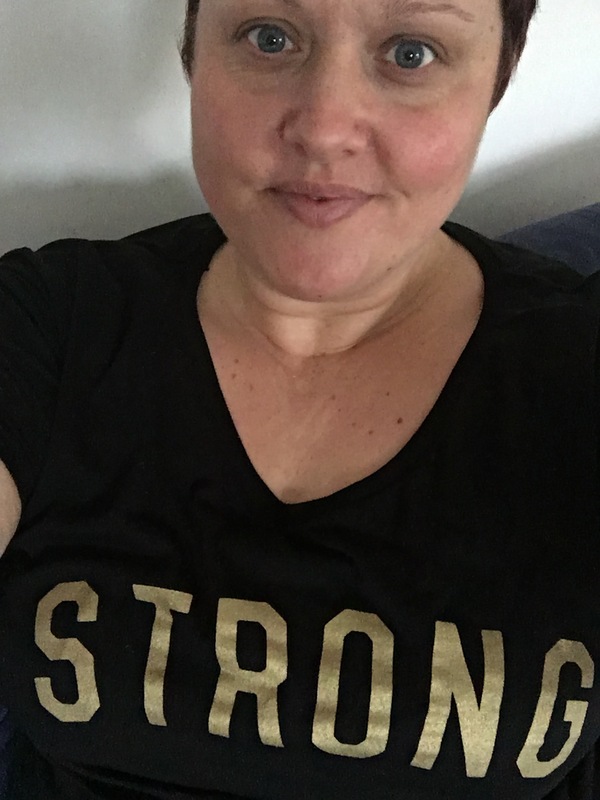 Before I was diagnosed with IIH, I loved nothing better than going to the gym, working out, lifting weights, sessions with my PT, and cycling. I would cycle miles for charity, my long suffering friend Lucy wholeheartedly would support whatever venture I presented her with, many a route we would take and get lost but always find our way home! For me excercise was the key to my weightloss, I followed a healthy eating plan and did some form of exercise 5 times a week, it helped me mentally and physically. I loved it, previously I had done every diet you can think of , Slimming world, Atkins diet, Dukan diet, Slim fast, but I had finally found something that worked for me, I was happy. Being diagnosed changed this for me, I found that any strenuous excercise just exacerbated my symptoms, my head would pound, I would become dizzy and weak. Not an ideal situation to be in, and thus becoming a viscous circle of eating, maybe even at points comfort eating then not burning off what I was eating as I previously had been. I love food, I love cooking, but best of all I love my Mums cooking, she is known for making amazing cake, cake that I felt made me feel better when I ate it!! When you feel really ill, you don’t think about diets or healthy eating, you think about how dreadful you feel, take your meds to try and get through each day, not about when you can next get to the gym. So my weight went up, along with that came the various medical professionals advice on losing weight, so off I would go and try to lose weight with no avail, I tried shake diets in desperation of shifting weight before the next Neurology weigh in/appointment, which worked but even losing nearly two stone I had no recognition for my efforts. Though it was a healthy shake diet where I could snack and eat a main meal, it was decided that it was too high in certain ingredients therefore not helping my head pain and I was back to square one. Now I am literally sobbing at the cake counter, waving at chocolate like it’s my long lost friend, dreaming that the peppermint tea I’m drinking for the fourteenth time that day is actually a full fat Latte. For someone who really struggles to lose weight I was so pleased, I’m hoping this continues, I KNOW my motivation for this won’t change, I want to see if it helps to alleviate my symptoms. In my research there are mixed stories, some people have lost weight and slightly better, some are significantly better and others have lost half their body weight whom are still the same – really poorly. In idiopathic cases, weight loss can bring about a remission and therefore should be encouraged. But in other idiopathic cases, weight reduction does not make a difference. If I don’t try I will never know! Excercise wise – studies show laughter actually is a form of exercise. Taking a moment to relax and have a laugh about those inevitable slip-ups helps the body release endorphins, or natural opiates. Studies show they both play a role in management of pain and induce a feeling of euphoric calm. So I am going to keep laughing adding in some swimming too maybe!! Off to find a lovely apple….. 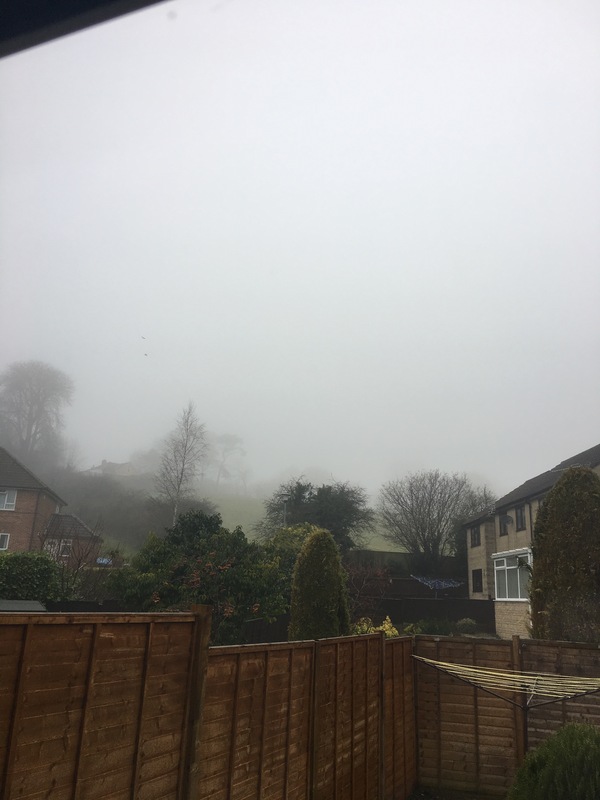 This is the view from my window today, no glorious sunshine, no chilly frost, just this foggy dismal day, it’s a day that makes you want to snuggle up on the sofa with a blanket, watch a film and eat rubbish, the skies are grey and dismal not dissimilar to how my eyebags are looking at the moment. Following on from the Acupuncture I had on Thursday, I have been absolutely wiped out, I’m not sure if it’s coincidence that I may possibly need a Lumbar Puncture or it’s as Vicky the Physiotherapist said I could feel quite tired after, tired is an understatement, I feel like I could sleep forever! I think I need to investigate whether I should feel this tired for this long, but as I say it could be a culmination of things, either way I have my STRONG top on today and that is the focus word of the day! I hate days like this when it’s dark and murky, it literally makes my crave crappy foods to eat why is this? I blame the weather but I think I feel like this daily lol, however in my quest to regain my life and possibly reduce IIH symptoms, I am 5 days into my new healthy eating plan and apart from today of wanting to eat anything in the cuboards, it’s gone well. I’m finding it hard to comprehend that it’s ok to eat 7 yes 7 starchy foods in my day, though the portions are small I feel paranoid at eating so much! Thinking that surely I am doing it wrong throughout the day, you may remember a few blogs back, I ended up at a weight management clinic, this is the diet they have asked me to follow. My day consists of the usual 5 mandatory portions of fruit and vegetables, this I have always done with ease, then to the 7 starchy portions so this is bread, rice, cereals, potatoes, cous cous, bagels, crumpets etc, well at 11am when I’m tucking into my low fat bagel I have such guilt thinking how on earth will this work when I have more starchy things to eat? We then have to fit in 3 portions of milk and dairy, my daily soya milk takes up one of these, then I usually have a yogurt or a matchbox size piece of cheese!! 2 portions of any sources of protein meat quorn etc, 2 portions of spreading fats, oils, dressings, sauces and finally you can have a 100kcal snack which may be high fat/high sugar foods or even alcohol. Seriously though I know to get anywhere I have to stay strong and motivated, today I’m probably just overtired, and it’s kicking in that I’m not eating the lovely (crap) foods I was over the festive period, where I went with the motto eat drink and be merry or in my case eat eat and be merry!!! I will be posting updates on how the healthy eating plan goes, the scales have been removed by my Mum from this house, so I can’t scale hop like I usually do, this in itself is an addiction I have had to beat, going cold turkey from the scales, so with that and sugar withdrawal it’s all going on! This is the link for those of you interested in my healthy eating plan, fingers crossed for me it works! Hope your day is a happy and healthy one.